This weekend sees the continuation of the bold curatorial experiment Static Flux, an exhibition masterminded by a duo of young curators based in Newcastle. The exhibition is housed at Navigator North in Middlesbrough and showcases new work by Tees Valley artists Roberto Picciau and Stephen Irving. According to curators Kim Gaiger and Helen Robertson (who work under the collective name AndNow Curatorial) “the aim is to create a platform for the artists to take a step back from their studio space, test work and ideas to further develop their practice.” In pursuit of this end, the four-day exhibition takes a peculiar format: Thursday was Day One – “Static” – in which the art works were presented in a relatively standard contemporary hang decided by AndNow Curatorial. But come Day Two, today, the exhibition was closed to the public so that the artists Picciau and Irving could critique the exhibition in its conventionally-curated form and workshop new solutions with the curators. Roll on Day Three – Saturday 29th November – when the exhibition re-opens to the public in its third phase – “Flux” – by which point it will have been dismantled and reassembled in accordance with the artists’ critique. 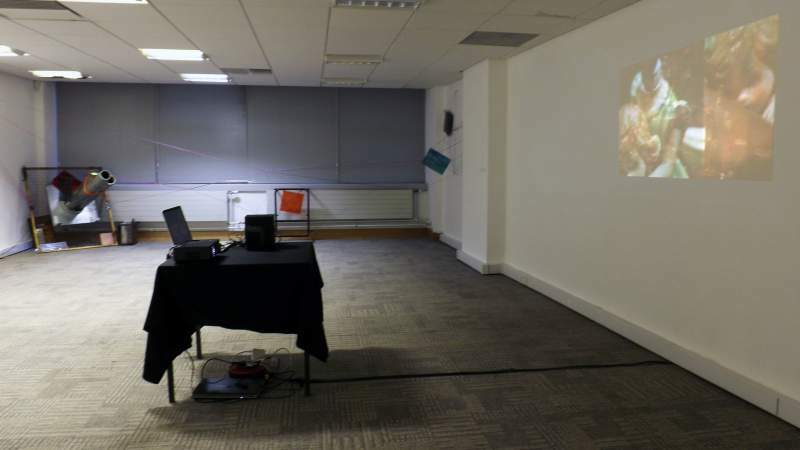 This is an odd fish of an exhibition by all accounts – not least for being housed in a disused office rather than a gallery space or even studio. The space brings its own challenges, chief among them being lighting and how to adapt basic florescent strip lights to the display of art. The obvious solution, and the one taken by AndNow Curatorial, is to simply position the wall works in each pool of illumination the lights produce. How the artists address this issue remains to be seen. The works on display include a painting by Picciau inset with a pair of eyes which eerily follow you around the room, and a site-specific installation by Irving which riffs off of the idea of the blue and red used in 3D glasses, instead using red and blue wool to create a physical and three-dimensional yet inaccessible space. The common thread between the artists is said to be that of “underlying themes of experimentation,” though arguably that is a characteristic of most contemporary art production today. Either way, the unusual bedfellows make for a thought-provoking combination of works. With regards the experimentation inherent in the exhibition itself, the idea is an excellent one. However, I do feel almost sceptical as to how different the exhibition could possibly become when metamorphosed into its ‘Flux’ phase, given that it is such a small space and there are only a handful of works. Though having said that, artists in this region never cease to amaze me with their ingenuity, and I’m a firm believer that curatorial decisions dramatically impact even the most straight-forward looking hang, so I am eager to be proven wrong. Whatever happens, I will be first at the door to see the result of their tinkering when the exhibition re-opens on Saturday morning.